Modernizing code with increased parallelism not only allows software to take advantage of the full breadth of Intel® architecture hardware capabilities—it can also increase power efficiency. 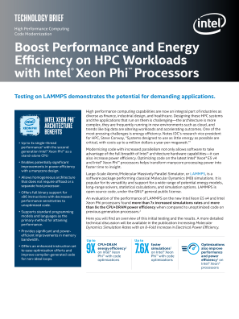 Optimizing code on the latest Intel® Xeon® E5 v4 and Intel® Xeon Phi™ processors helps transform manycore processing power into faster time to insight. Large-Scale Atomic/Molecular Massively Parallel Simulator, or LAMMPS, is a software package performing classical Molecular Dynamics (MD) simulations. It is popular for its versatility and support for a wide range of potential energy models, long-range solvers, statistical calculations, and simulation options. LAMMPS is open source code, under the GNU* general public license.